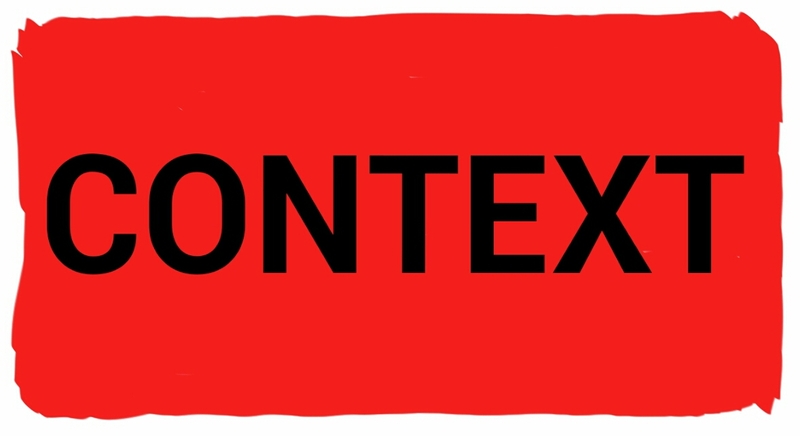 context – the whole situation, background, or environment relevant to a particular event, personality, creation, etc. This is one of the BIGGEST gripes I have about journalists who write the news stories most of us read (I am unable to watch the news on television anymore due to sensationalism). I have seen too many journalists take a comment out if context to “create” a story which in many cases causes unnecessary controversy. As most of my readers know, I am a Christian. Over the years I have studied the Bible in-depth and in turn have become a lay Bible teacher with a focus on youth (they are after all our society’s future). Everyone of my students over the past 15 plus years will tell you that I have taught the concept of “context” whenever there is a question about a “verse” in the Bible. Believe it or not, “context” is an absolute necessity in any subject you study in the Bible, or life in general. Cults have been created by the twisting of a few select passages as well as the selection, deletion, or addition of a few words. Unfortunately it is the same with the “free press” in the Republic of the United States of America (for all of you who thought we are a democracy, you are not smarter than a fifth grader). I enjoy reading about the happenings in our world (take note: I did not say news…this is an important point). When I find a story or event that interests me, I usually turn to the BBC first and then read additional news stories from several different sources as well as countries. It is only after this in-depth research that I feel I have an understanding of what is really happening. Yesterday I posted a story in defense of Phil Robertson of Duck Dynasty. If you happened to read the whole story in context of both words and time period, you may have come away not agreeing with what Phil Robertson shared about his life but what he did say was true to what the Bible teaches in context. I found some of the statements Phil made crude but I’m around people everyday who are far worse (and have seen much worse on “Freshly Pressed”). I can’t begin to imagine what it would have been like to work in a cotton field in the South hoeing weeds. I live where it can reach 110° during the summer and after 95° I’m looking for the shade. After 100° I retreat to a cool place to sit it out. In context, Phil Robertson was sharing from his experience, not history, as a farm hand in his corner of Louisiana. Based on his age this was during the start of the equality movement in the United States.. From Phil’s perspective the farm owner treated his employees well. He even called himself “white trash” which is not a flattering statement. My hope is that someday we will no longer have discussions or disagreements about our race, religion, sexual orientation, or beliefs. Until then I will continue to check the “other” box and write in “human”. Have you ever read One Blood by Ken Ham? I don’t agree with all his stuff, but in this book he makes the case that believing in God as the creator of the original man and woman makes us all related UNLIKE Darwinism and evolutionary thought which divides humans into competing races and survival of the fittest, etc. It’s very intriguing.